The 2007–08 NHL season was the 91st season of operation (90th season of play) of the National Hockey League (NHL). It began on September 29, 2007. The regular season ended April 6, 2008. The Stanley Cup playoffs ended on June 4. The Detroit Red Wings won the Stanley Cup. GP = Games Played, W = Wins, L = Losses, OTL = Overtime/Shootout Losses, GF = Goals For, GA = Goals Against, Pts = Points, Rank = Conference rank (division leaders are ranked first to third), Top eight teams in each conference qualified for post-season playoffs. The greater number of games won. The greater number of points earned in games between the tied clubs. The difference between goals for and against. After the 2007–08 NHL regular season, the standard of 16 teams qualified for the playoffs. Lester Patrick Trophy: Brian Burke, Phil Housley, Ted Lindsay, Bob Naegele Jr.
↑ 1.0 1.1 1.2 1.3 1.4 1.5 "2007-2008 Standings by Division - NHL.com - Standings". NHL.com. The National Hockey League. Retrieved 2010-05-10. 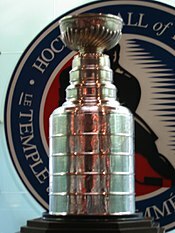 ↑ 2.0 2.1 "2007-2008 Standings by Conference - NHL.com - Standings". NHL.com. The National Hockey League. Retrieved 2010-05-10. This page was last changed on 11 November 2016, at 16:50.